Boy Scout Troop 50 | Chattahoochee Council | Auburn, Ala. | #troop50: Check out what we did to our trailer! Check out what we did to our trailer! There will be no mistaking Troop 50 when we hit the road for our next campout! New troop shirts in February, and now our trailer bears the Troop 50 logo. 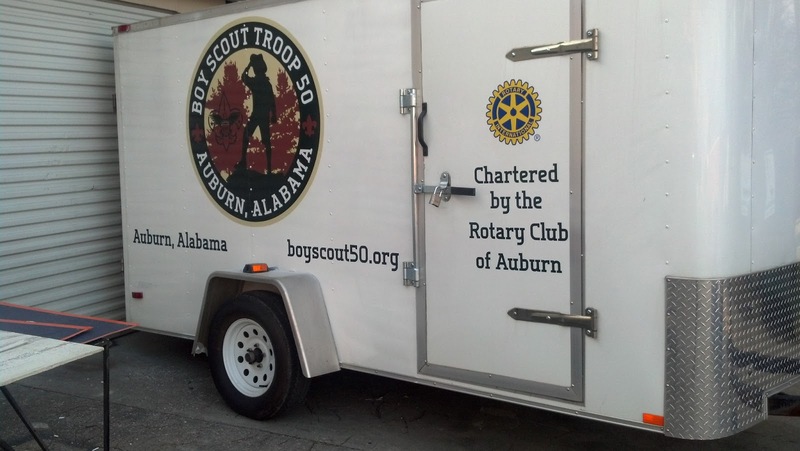 Thanks to Sign World of Auburn for applying our signage, and Master Graphics in Auburn for giving us our new look, there will be no mistaking where Troop 50 is heading! We're also proud to make our chartered organization, the Rotary Club of Auburn, part of our trailer as a way of saying "thanks" for all they've done to get our troop started up and going in such a short amount of time. If you know a Rotarian, or someone who works at Sign World or Master Graphics, please thank them for their support of Troop 50!